Brain Age²: More Training in Minutes a Day! Brain Age2: More Training in Minutes a Day! Dr. Kawashima: Mehr Gehirn-Jogging: Wie Fit ist Ihr Gehirn? Más Brain Training del Dr. Kawashima: ¿Cuántos Años Tiene tu Cerebro? More Brain Training del Dr. Kawashima: Quanti Anni ha il tuo Cervello? Programme d'Entraînement Cérébral Avancé du Dr. Kawashima: Quel âge a Votre Cerveau? "Brain Age 2: More Training in Minutes a Day! 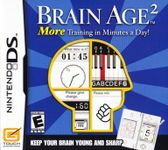 (stylized as Brain Age²), also known as More Brain Training from Dr. Kawashima: How Old Is Your Brain? in PAL regions, is an edutainment video game and the sequel to Brain Age: Train Your Brain in Minutes a Day! (2005). It was published and developed by Nintendo for the Nintendo DS handheld game console. Before the game begins, the player must perform a Brain Age Check to determine their brain age, which ranges from 20 to 80, to determine approximately their brain's responsiveness. A brain age of 20, the lowest age that the player can achieve, indicates that the player's brain is as responsive as that of an average 20-year-old. After the player is told their initial brain age, they can complete a series of minigames to help improve their brain's responsiveness, after which they can run Brain Age Check again to determine their updated brain age." Source: Wikipedia, "Brain_Age_2," available under the CC-BY-SA License.